We love a good steak here in our home and probably prepare a steak for dinner at least once a week. We like high-quality cuts of beef and often times we will select a filet mignon. 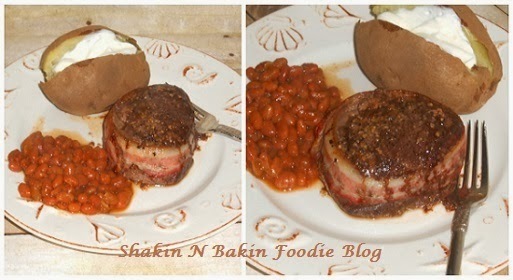 Last week we decided to make a bacon wrapped filet mignon and for those of you who don't realize how simple this is to make yourself...we are going to give you the recipe today. Brush your steak with extra-virgin olive oil and then season both sides of your steak with some salt, ground black pepper and McCormick steak seasoning. Place them in a dish, cover and refrigerate for a few hours. Remove. Wrap one slice of bacon around the outside perimeter on each one. You won't have to secure the bacon at all, but wrap it tightly. You can bake them in a 350 degree oven for approximately 25 minutes, flipping them halfway through the cooking cycle or toss them onto a hot grill and grilling them until done. We like ours medium-well so it takes about 25 minutes for them to cook through for us. That's it! Easy and delicious!